Let me start out here by saying that I am definitely not a history buff. Obviously there have been some very captivating people and events throughout history which anyone would find interesting, but that doesn't mean I'm going to go out searching for them. So, imagine my surprise when I actually ELECTED to watch a DVD box set about several of the American Presidents. Can you tell there hasn't been much on television lately? Or even on DVD for that matter? There are some good ones to look forward to, such as Iron Man which will be releasing soon, but until then I thought I'd tell you all about my experience watching this PBS documentary series about the presidents. This box set, unlike some other box sets, actually has a box. It's nothing fancy, just a box which has one side open to allow access to the plastic DVD cases inside. Each of these cases are slimline style, even the ones that contain two discs, which is fantastic and I think a great decision, as the outer box is already plenty thick. The front of each of the sleek black cases contains the name of the president above a black and white the man. The hinge side of the cases have a small picture of the president at the top, followed by his name in the center, and if it's a two-disc set then a big number "2" toward the bottom. 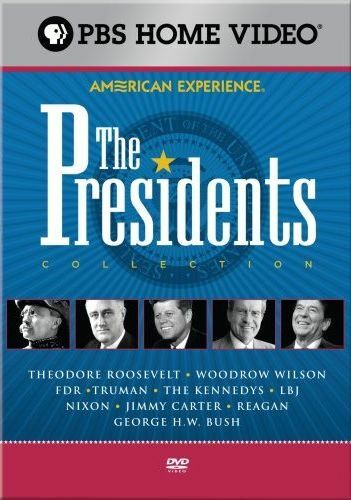 This DVD set covers 10 US presidents, Theodore Roosevelt, Woodrow Wilson, Franklin D. Roosevelt, Harry S. Truman, John Kennedy, Lyndon B. Johnson, Richard Nixon, Jimmy Carter, Ronald Reagan, and George H.W. Bush. I knew a little about each of these men from high school and college history classes, but not enough to be able to hold a decent conversation about them. These DVDs changed all that (but don't take this to imply that I'd actually WANT to hold a conversation about these guys). They are filled information about the men, about their early lives before politics, how they eventually worked their way into the presidency, and then a little about what happened to them after their presidency ended. It does a good job of covering the good points and the bad points, their accomplishments and their failures, why people loved them and why people hated them. I'm probably going to be stating the obvious here, but one thing I took away from this is that there is no way in the world I could ever be president of the United States of America, nor do I think could most people. Of course, this opinion formed after watching all about these presidents, so I suppose that the presidents they didn't cover could be more like your average joe. These, guys, however, were special, even from an early age. They all had strong feelings, extreme determination, and felt it was their obligation and duty to effect change. These people knew what they want, and would do what they could to get it. Me? I'd love a box of fresh donuts, but that's like all the way down the street and it's hot out and gas is expensive and I know what I want but also know how to talk myself out of it because it's too much trouble. The series starts with Theodore Roosevelt. He is probably most famous for undertaking the building of the Panama Canal, but he also tried to get universal health care (yeah, still working on that one...), set up tons of national parks, and eventually even won the Nobel Peace Prize. The president after Theodore Roosevelt, William Howard Taft, is oddly missing from this collection, but they have the next one, Woodrow Wilson, and this is actually one of the two-disc sets. The thing I remember most about Wilson from history class is his Fourteen Points, which he believed could prevent future wars if adopted. But they weren't adopted, and now I understand why, and how this caused the end of the first World War to gradually lead to the beginning of the second. The next three presidents, Warren G. Harding, Calvin Coolidge, Herbert Hoover, are also missing from this collection. Next is Franklin D. Roosevelt, who is commonly referred to as FDR. The main thing I remember about this guy was that he actually got elected four times! This two-disc set shows why. This man was loved by just about everybody. He also created the New Deal during the Great Depression to help recovery, and took us into the World War, which helped put the US on the path to becoming a global superpower. The next president is Harry S. Truman, who was actually a failed businessman (several times) before finally succeeding in politics. He was Roosevelt's vice-president, and took over the presidency after Roosevelt's death. At first, this guy really didn't seem like presidential material, but being thrust into that position left him little choice. He is probably most famous for ordering the atomic bombs dropped on Japan, and this documentary does a great job of probing into the circumstances behind this decision. The following president was Dwight D. Eisenhower, but he is also missing from this collection for some reason. I thought he was one of the important presidents, but I guess not enough to be included here. From this point, all the remaining presidents are included up to George H. W. Bush. For Kennedy, they actually cover the entire family, and it was interesting to learn why so many people have such strong feelings toward them, and why they are called the closest thing to royalty that we've got. Prior to watching this, I really had no idea why this family seemed to important to everyone. Well, I won't go through all of them as this is already getting kinda long. In the latter DVDs, we are presented news footage and interviews with friends, family, and colleagues to help tell the stories of these leaders, while the earlier DVDs are made up of early interviews with historians and the reading of documents, and then old film footage presented when possible. This is a nice set to not just learn about the men who have to make the tough decisions, but where they came from and the circumstances surrounding those tough decisions. This wouldn't be my first choice for a Saturday night, but it sure beats reading a history text book. PBS Home Video and Paramount Home Entertainment present an extraordinary collection of compelling and in-depth biographies of ten of the most influential leaders in modern history with THE PRESIDENTS COLLECTION, arriving on DVD August 26, 2008. The acclaimed “American Experience” series profiles the lives and legacies of Theodore Roosevelt, Woodrow Wilson, Franklin D. Roosevelt, Harry S. Truman, John Kennedy, Lyndon B. Johnson, Richard Nixon, Jimmy Carter, Ronald Reagan and George H.W. Bush in this captivating box set featuring interviews with people close to the Presidents, historians, filmmakers, scholars and more. THE PRESIDENTS COLLECTION DVD set also includes over 90 minutes of bonus features, further delving into the singular lives of these complex and powerful men.